Whilst orangutans are found in oil palm plantation or community land, it means their habitat is still shrinking. However these orangutans can still have a safe future in the Lamandau Wildlife Reserve. Already this year two orangutans have been rescued and translocated into the Reserve. This is Kuala’s story, sent by one of our staff, a six year old male, he had been damaging the village garden of Mr Joko. Mr Joko kept him for over a week, before a neighbour pointed out that orangutans are a protected species. Mr Joko then contacted the BKSDA who, with the Orangutan Foundation's vet and staff, travelled to the village 'a 10 hour journey from the Foundations office', where Kuala (named after the village) was handed over. After all the required health checks were clear he was able to be transferred to the Reserve. Seemingly impatient to be back in the forest, Kuala stood rattling his cage and looking upwards at the trees. Once the cage door was opened he surveyed his surroundings and then without hesitation was straight up a tree. He was moving so quickly from tree to tree that it was difficult for the staff monitoring him to keep up, but by the end of the day, they were able to see he had already made his night nest, back in the wild where he belongs, and safe. He was monitored for the next ten days. As he walked through the village, resident came up to him and, recognising Tobing as a policeman, handed him a baby orangutan. The orangutan had been found in an oil palm plantation close to the village. Tobing named the orangutan infant “Keno”. Orangutans enter into settlements and villages because much of orangutan forest habitat nearby is being destroyed, in this case due to a palm oil plantation. This kind of industrial encroachment has significantly contributed to an increase in the number of orangutans needing to be rescued and translocated in recent years. In addition, this particular plantation and village are near the Lamandau Wildlife Reserve border, the protected area in which the Orangutan Foundation work and release orangutans into the wild. In Borneo, human habitation and oil palm plantations are often side by side. Different types of land use can be in areas very close together. Here, areas of forest are close to oil palm plantations and often to villages. Unfortunately, this makes it easy for orangutans to find their way into areas of human settlement. Tobing reported the situation to the police, who decided to bring the baby orangutan to the local police station. It was then decided to inform the discovery of this infant to the Natural Resources Conservation Agency (BKSDA). Due to this quick reporting and an organised system, the very next day, the Orangutan Foundation staff and BKSDA officers arrived (from Pangkalan Bun) to meet ‘Keno’ and it was decided to translocate him. He was kept in a transit cage at the BKSDA offices, and after a full health check and a few days to acclimatise. He was then moved to Gemini Camp (of the Orangutan Foundation camps), and Keno started his soft release programme. Staff saw that he was well and confident and so allowed him to get back into the trees again, as the staff keep a watchful eye. He had some minor bruising on his foot which has already healed up. He enjoys his diet of fruits from the forest. Now we hope to find a suitable surrogate mother for Keno. The ideal surrogate mother would either have an already independent offspring or no have no offspring at all. We'll make sure we keep you up to date with Keno's development and progress through his soft release! 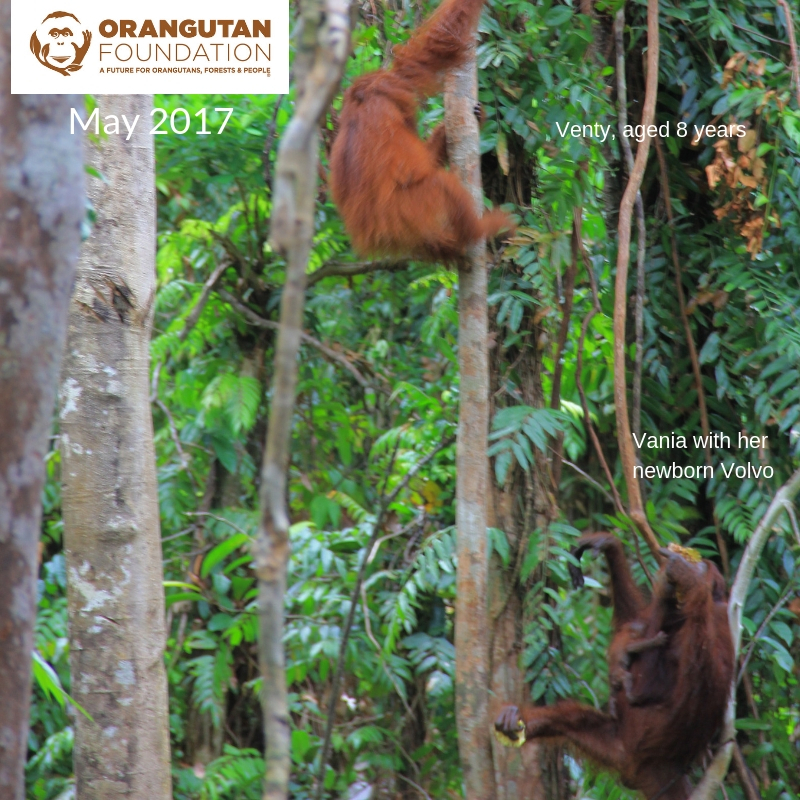 More orangutan rescues, ensuring wild individuals stay wild! Very recently, this mid July, the Orangutan Foundation team were called to a local palm oil plantation by the owner of the land to relocate an orangutan that had been seen in the area. The farmer wanted the orangutan removed to protect the quality of the crop and near by villages. Additionally, orangutans can be tempted into the nearby community and plantations by palm fruit as well as the more popular pineapples, grown in the village gardens. They were pursuing the individual until after sunset, and finally around 7pm the orangutan was darted and taken to the BKSDA office in Pangkalan Bun were it was given a check up. The individual was a male around 9-11 years old estimated from the dental work… “From his physical condition looks healthy, still very wild, in a healthy condition and had good blood circulation and health.” Having come straight from the wild and as it was in such good health, the Foundation’s vet recommended a hard release very soon. 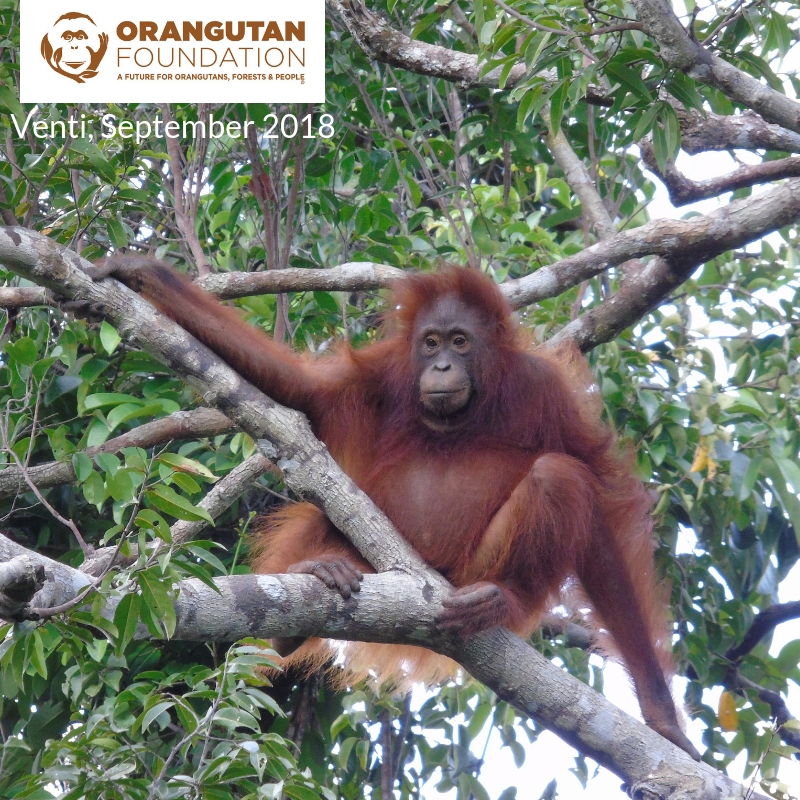 The Orangutan Foundation has been supporting the orangutan reintroduction programme in the protected Lamandau River Wildlife Reserve since 2000. It is one of the few places in Indonesia where translocated and rescued orangutans can be released into a protected area. The orangutan was successfully released in the area between Camp Gemini and Camp Siswoyo on the 17th – just last Friday! This site was chosen because the water level of the river is still very high, allowing the boat to access good release points. Dr Wawan was also able to put together some footage taken – watch a vital insight into our orangutan translocation work by clicking here ; "A 'hard' release on the 17th of July" (click this link to download short film here!). Please sign this petition to the Indonesian President to halt the destuction of the Tripa Swamps, home to a few hundred critically endangered orangutans. Increase in fires burning in Tripa highlight Indonesian Government failing to cease deforestation; orangutan population doomed unless illegal activities halted immediately. Another massive wave of fires currently sweeping across the Tripa peat swamp forests has highlighted the accelerating destruction and ongoing disregard of Indonesian National Law by palm oil companies inside the protected Leuser Ecosystem, despite a high level National Investigation launched months ago, which is yet to report on findings. A recent spike in the number of fires was recorded by satellites monitoring fire hotspot activity in Sumatra, and confirmed by field staff yesterday who filmed and photographed numerous fires burning in the palm oil concessions operating right across in Tripa. The five companies at present actively operating in Tripa have responded to the increased media scrutiny and current investigation by increasing security on their plantations. Some are even being guarded by military and police personnel stationed along access routes while illegally lit fires burn inside. “The ongoing destructive activities of these companies during the investigation indicates their complete disregard for Indonesian law and the authority of the ongoing investigation, and the government is allowing this to happen.” Stated Kamaruddin, lawyer for the Tripa community. “A direct Presidential Instruction is urgently required to bring an immediate halt to the rampant and illegal destruction of Tripa, not a speech telling the world deforestation is a thing of the past.” Kamaruddin added. “There is no doubt that each of these companies is breaking several laws. Whilst we realize, and very much appreciate and support the investigation going on (by the Department of Environment), it’s proving to be too little too late. These companies simply have to be ordered to stop immediately, and that order to be strictly enforced, otherwise the Peat Forests and inhabitants of Tripa will be lost forever”, he added. One of the five companies operating in Tripa, PT. Kallista Alam, was challenged in court and its concession area recently reinstated as off limits to deforestation and degradation in the 2nd revision of Moratorium Map on May 25th, 2012. This particular concession has been the subject of an ongoing legal battle as it clearly contravenes National Spatial Law No 26/2007 and Government Regulation 26/2008, since it was granted inside the Leuser Ecosystem National Strategic Area for environmental protection, in which no concessions can be granted that damage the environmental protection function of the ecosystem, and in which all activities that do damage the ecosystem must be halted, and damaged areas restored. Fires continued to rage late yesterday in the northern stretches of the PT Kallista Alam concession. Likewise, numerous obviously deliberately set fires were also observed in the concessions of PT. Surya Panen Subur 2, PT. Cemerlang Abadi, PT. Gelora Sawita Makmur , PT. Dua Perkasa Lestari and an area known as the PT Patriot Guna Sakti Abadi concession, even though the latter was never formally granted. “The situation is indeed extremely dire” reports Dr Ian Singleton of the Sumatran Orangutan Conservation Programme. “Every time I have visited Tripa in the last 12 months I have found several orangutans, hanging on for their very survival, right at the forest edge. Its very easy to find them and we have already evacuated a few lucky ones to safer areas. But when you see the scale and speed of the current wave of destruction and the condition of the remaining forests, there can be no doubt whatsoever that many have already died in Tripa due to the fires themselves, or due to starvation as a result of the loss of their habitat and food resources”, he explained. The Tripa peat swamp forests have received considerable international attention, much of it focusing on the fact that the burning of Tripa’s peat swamp forests made a mockery of a 1 billion USD agreement between the Governments of Indonesia and Norway to reduce carbon emissions from deforestation and forest degradation, also known as the REDD deal, since the peat alone in Tripa sequesters huge amount of carbon that is being released into the atmosphere even now . Tripa was also high on the agenda at the first meeting between the newly inaugurated Governor of Aceh and the European Union, just a few days ago. Furthermore, on June 13th at a global policy address on the future of Indonesia's forests, ahead of Rio+20 summit, at CIFOR, President SBY himself proclaimed that “deforestation is a thing of the past” and "Losing our tropical rain forests would constitute the ultimate national, global and planetary disaster. That's why Indonesia has reversed course by committing to sustainable forestry." Yet the ongoing destruction witnessed by the coalition team in recent days is a clear indication that these are simply empty words, and that Indonesia is giving no reasons for its international commitments to be taken as anything more than mere rhetoric. “But without an immediate halt it will all be lost, to the ultimate benefit of only a handful of already incredibly rich people based elsewhere. This whole thing makes absolutely no sense at all, not environmentally nor even economically. It is simply greed, on a massive scale. A simply staggering scale in fact.” Stressed Dr. Ian Singleton. Thank you for going orange for orangutans! We have so many people to thank for joining in with this year's Orange for Orangutan Day. So far we have raised nearly £7,500 for our 'Protect Me and My Tree Appeal' and this matches last year's total, but the money is coming in daily so we hope to raise much more! Here are a few photos from the various orange themed events that took place. We really appreciate everyone's efforts and their generosity. Also, it's not too late to help - please make a donation and help us to reach our target of £15,000. Thank you Lorraine G and Tal B for your donations. Pam Swan organised a cappucinnos and cookies party and with her friends raised over £200. Pam even provided her dog Jake with an orange scarf so he could join in! The raffle offered loads of prizes! Pam's husband was in charge of the cappuccinos and serving the cookies (all baked with non-palm oil ingredients of course!). Another one of our super members, Jacha, organised a dinner party for 40 people and raised over £1,000! Jacha's dinner party with fabulous orangutan images on the walls.